In this shot you see the Harold's Club in downtown Reno boarded up as it was in the 1990s. 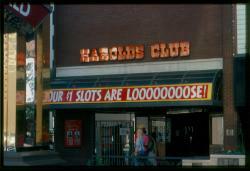 The sign still reads "Our $1 slots are loooooooose!" The casino was torn down six years later. Source Caption: Isern Comas, Jose P.,, photographer. Banner says it all: "Our $1 slots are loooooooose!". Harolds Club. Reno, Nevada - August 1, 1993. 1 slide: color.